Actor Kelsey Grammer, known for his long-running roles in US sitcoms Cheers and Frasier, is preparing to release his first beer having founded a brewery in upstate New York called Faith American. The brewery will be located in Delaware County, near the Catskill Mountains, in Margaretville – a village on the northern edge of the Catskill Park – and will be named after his five-year-old daughter Faith Evangeline Elisa. Kelsey has owned the property in Delaware County for 25 years and has been working to bring it up to scratch as a brewery for several years. Speaking to Kelly Ripa on US chat show Live with Kelly and Ryan, Grammer confirmed the project and the upcoming release of a beer, but said that building work to the brewery itself had been held up. Reports of the venture first emerged last year, after a picture of Kelsey Grammer and Paul Leon, executive director of the New York State Brewers Association, was posted to Leon’s Facebook and Instagram account, before swiftly being deleted. The brewery is located inside a barn on a dairy farm that the actor used to visit for Thanksgiving as a child. “It’s always been my favourite place in the world to go to,” he continued. “I used to go there when I was a little boy. It has a barn on it (property) that is 100 yards long, which was a dairy farm years ago and it was such a prosperous place and then it really fell on hard times, Delaware County specifically, and it’s been, I guess, the poorest county in New York state for a long, long time. Grammer shot to fame in the 1980s on the TV sitcom Cheers, before taking on the leading role in long-running US comedy Frasier. He also voices the character of Sideshow Bob in The Simpsons. Love him! 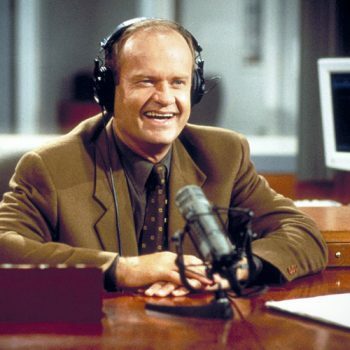 Love the sitcom “Frasier”! So surprised it’s not a winery he’s opening!!!! The only thing that confuses me about this (I love Kelsey and “Frasier”, so this isn’t my being critical) is that I was under the impression Kelsey has very serious substance abuse problems. I know a recovering alcoholic ran a bar on “Cheers”… but still… it just seems like a strange investment for a guy who is/was an alcoholic and probably doesn’t need the money.